The foramen spinosum is located posterolateral towards foramen ovale that links the middle cranial fossa together with the infratemporal fossa within the posteromedial portion of greater wing of sphenoid bone. From the maxillary artery the middle meningeal artery rises vertically and travels via the foramen spinosum in order to go inside the cranial cavity. From the inferior surfaces of the greater wings of the sphenoid bone, the spines of the sphenoid are vertical projections located one on both sides. Each spine is located directly posteromedial towards the foramen spinosum. 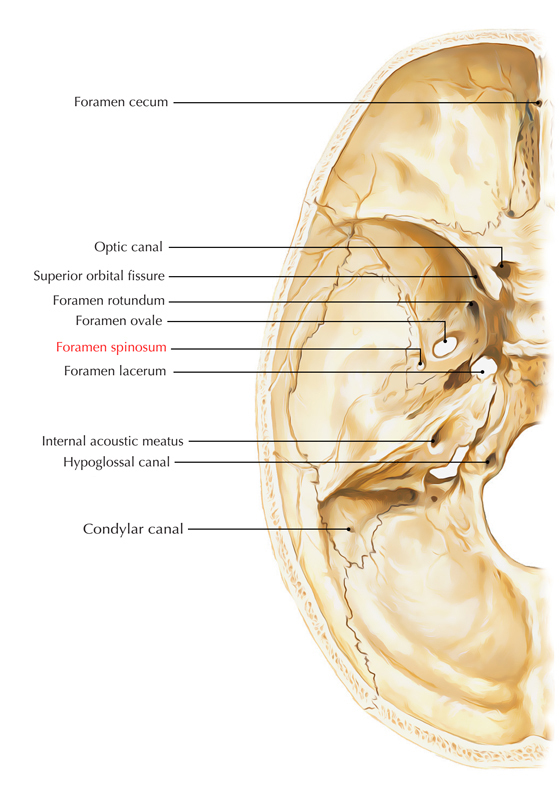 Foramen ovale is located anterior as well as medial towards the foramen spinosum. Canaliculus innominatus is located on a bar of bone in the middle of the foramen ovale as well as foramen spinosum. It conveys the lesser petrosal nerve when it does not travel through foramen ovale. Spine of sphenoid is a small sharp bony protuberance and is located posterolateral towards the foramen spinosum. Foramen spinosum is either absent or small whenever the middle meningeal artery originates directly from a stapedial artery sometimes. In that condition the nervus spinosus may perhaps re-enter the head via the foramen ovale.